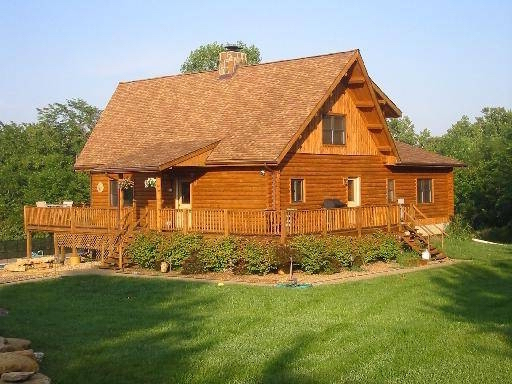 Transform your log home with the gentle cleaning and protecting solutions from Renew Crew of Johnson County. Our proprietary foam cleaner and long-lasting polymer sealant will restore the luster of your log or cedar siding and keep it looking its best for years to come. Revitalize your home without destroying the integrity of your wood siding. Our team is here to help. Traditional siding cleaners are often filled with chlorine, which can change the pH of your wood and bleach the surface for good. These chemicals are dangerous to nearby plants, and they can quickly change your curb appeal for the worst. The Renew Crew cleaning formula effectively removes mold, dirt, and mildew embedded in your wood without the use of chlorine. Our eco-friendly foam is 100% safe for pets, plants, and people, so you will not have to worry about dangerous chemicals lurking in the air. Our cleaner will loosen grey wood fibers on your wood siding that may age your home prematurely. The grey will wash away with the mold and mildew, leaving a lustrous shine for you to enjoy. We use controlled power washing to clean off your wood once the presoak foam has pulled up the set in dirt, stains, and mold. Our technicians are trained to use pressure washers in a safe way that will not harm the appearance or stability of your wood. Contact Renew Crew of Johnson County today at 913-661-9663 to learn more about our 3-step cleaning process. Our semi-transparent sealant will shield your log home from harmful UV rays and repel water off the surface of the wood. The sealant helps restore your wood’s natural beauty and emphasize the gorgeous patterns throughout. With frequent applications, you can preserve the life of your logs and keep your home structurally sound at the same time. Want an estimate for log home cleaning and protecting? Call 913-661-9663 to schedule a free consultation with one of our specialists. We will come out to your property to assess your specific needs, and then we will provide an estimate for our services. Whether you need a one-time cleaning or scheduled maintenance for your log home, we have a solution that’s just right for you. Contact Renew Crew today!